I’m beginning to think that parenting is just a lifelong excuse to turn anything into a celebration. Because if you really think about it, there is always something to celebrate. The problem with this of course, is…there’s always something to celebrate, i.e. there’s always some kind of treat that — in our house at least — seems to be central to the celebrating. It’s the last day of school before spring break: By The Way Bakery cupcakes! You just rode your bike four miles: Mint chip ice cream! It’s Daddy’s birthday: Cherry pie! No cavities at the dentist: Pain au chocolat! It’s Passover: Matzoh brittle! It’s Easter….oh dear Lord, Easter. I think this holiday — which we technically don’t even celebrate — might have officially eclipsed Halloween as the biggest treat-o-thon in our family. It begins with the obligatory air-dried Peeps, then the neighbor’s Easter Egg hunt where we are lucky to come home with only a few chocolate eggs. (Woe is the poor soul who wins the 1000 Jelly Bean Jar contest!) And then there is the long-awaited treat-filled basket from Grandma, which, to the girls delight, always includes a ginormous chocolate bunny. A ginormous chocolate bunny that ends up sitting in his plastic case in the corner of the kitchen like a museum piece: So fun to look at, yet never consumed. 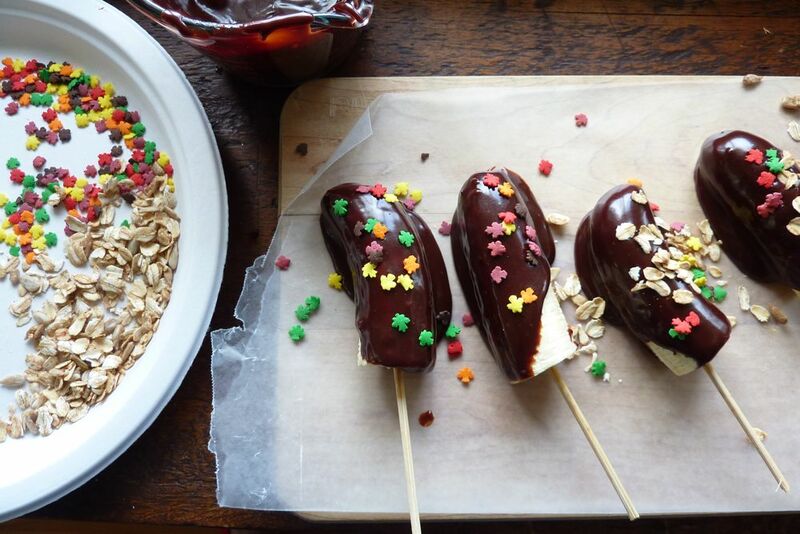 This year, we decided to change that — instead of letting him get all dusty and sad, we melted him down to make the healthy-ish chocolate covered banana pops that you see below. They are easy, delicious, and just the thing to cap off our dinner on Thursday, when we plan to celebrate the dog’s third birthday. There is a recipe for these in my first cookbook, but you don’t really need official instructions. Before you begin, cut your bananas in half, insert popsicle sticks or halved wooden skewers (as shown below) and freeze for about 15 minutes on a flat surface. While bananas are freezing, melt down your bunny over low heat (removing all bowties and styrofoam accessories, please), whisking as the bunny shrinks*. (You can also do this in the microwave in a Pyrex for about a minute, depending on the size of the bunny.) When your chocolate has melted, pour into a deep measuring cup or a cereal bowl. 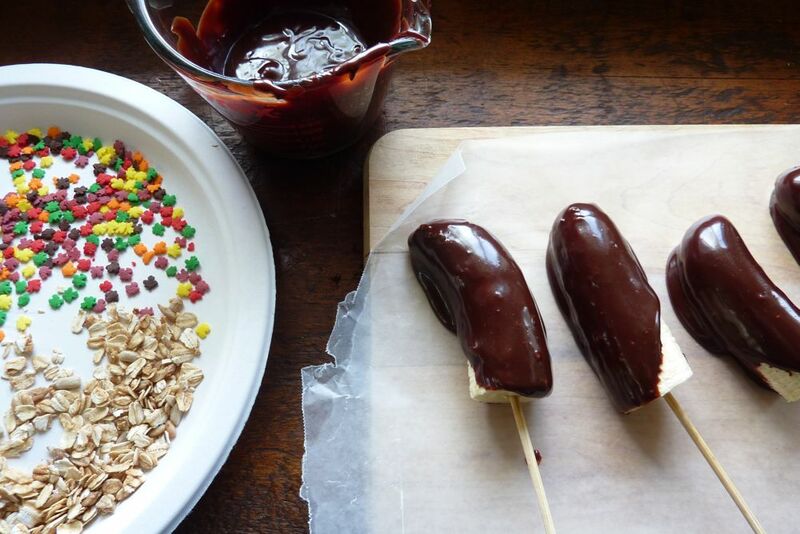 Dip your now semi-frozen bananas into the chocolate and place pops down on a wax-paper covered surface. Quickly sprinkle oats, sprinkles, or chopped nuts on top before the chocolate hardens. Freeze until ready to eat, at least a half hour. *I added water as mine melted to get to the right consistency, but usually even a drop of water or hint of steam puts the chocolate at risk of seizing, so only do this if absolutely necessary. My friend who works in a test kitchen surmises that the reason mine didn’t seize and get grainy was because the chocolate in the bunny was not, in fact, real chocolate. The chocolate hardens fast, so add your toppings quick like a bunny. Omg that picture is hilarious. Was it traumatic for the kids to see the bunny in the pot? My kids love that recipe I have made it from your book a bunch of times!! Finally!! Something useful to do with the bunnies!! That first part is oh-so-true! Love the bunny in the pot! Ha! Not quite Fatal Attraction! BEST PICTURE EVER! Oh the brilliance! I am so with you, our candy totals for Easter BY FAR eclipsed Halloween — it’s insane, we have FOUR choc bunnies and one CHOCOLATE CHICKEN! I’m gonna melt that chicken. Great picture. Great idea. Question–doesn’t melting chocolate seize and get grainy if it comes in contact with water? Nancy — I didn’t have a problem with that, but a few of you have written to tell me you have. 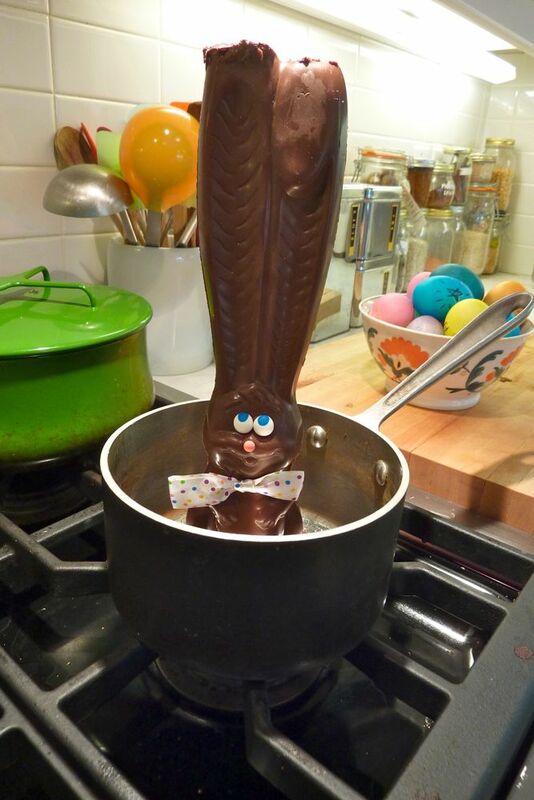 My friend in the test kitchen of a big food magazine told me the rule of thumb is to avoid even a drop of water or extra steam from getting in the chocolate, but she also guessed that there were enough additives in the bunny chocolate to prevent it avoid seizing. I’ve adjusted the instructions above to address this. Thanks for writing. There must be something wrong with me … because seeing that rabbit in that saucepan has brought me more joy than I should admit to on the Tuesday after Easter. What a great idea! It’s much better than when I put the bunny high on a shelf, tell my kids we will have it another time, and then weeks later when almost everyone has forgotten about it, sneak into a corner and devour it alone. Hah! I was just telling my sister about all these holidays… they all have treats and prizes with a small addendum- “if you’re good…” fill in the blanks. I think long ago some smart parents realized if they cajole their children into doing good by promising treats and prizes that correlate with holidays, life would be easier. Now my kids are still naughty (I have three boys) and they still get prizes. And my husband expects something. i was thinking exactly what you said about that bunny being made of “real” chocolate. this is so kid-friendly: dipped in chocolate, AND on a stick. thanks for the tip! What a hoot! Were the kids at all traumatized by seeing Benjamin Bunny go melting down, down, down? Great idea. I have to say the picture of the bunny in the pot made my day. My one stroke of brilliance this Easter was to fill the Easter hunt eggs not with chocolate, but with a variety of Annie’s bunnies treats. Holiday appropriate, didn’t melt in the sun like last year, and a lot more healthy / less tempting for Mom. Happy Birthday to your dog. This year I’m throwing a double birthday party for my husband and my bike. Celebrating 70 years!! 50 for the guy and 20 for the bike. It’s a real milestone for that hunter green Giant Iguana. Still riding strong!